Rocky Balboa – OK, with Rocky V out of the way I can honestly say picking the rest got A LOT harder. But – if I am being honest I think this is where “Rocky Balboa” or, unofficially “Rocky 6” should be. This movie had no right being this good, because the premise is almost laughable. Mid 50’s (?) Rocky being called out of retirement by a ESPN simulation of him beating the current champ? C’mon now. YET – this movie is both really well acted and the fight scene surprisingly great. No – he doesn’t win in the end but he goes the distance – and to ANY Rocky fan you know that means an epic ton. The father – son dynamic here also gave me all the feels. While the villain, Mason “The Line” Dixon” is not even in the conversation of the great Rocky nemesis in the series, he is both capable and not positioned as a complete a-hole – which is a good thing. I am not ashamed to say I really liked this movie. As Paulie says “Rocco! This is the last round of your life!” And my man Rocky fights like it too. Creed II – Maybe it’s too fresh in my mind, and this option could change after some more reflection. I really loved this movie, but to me (at this point) the others ahead of it are just a bit better. STILL – this movie was fantastic. Adonis Creed (son of Apollo) is now the champ with Rocky as his “Mick”, he is married and about to be a dad. Things going great, right? Welllll, Ivan Drago and his son now appear and challenge him (and his father’s) legacy. The fight scenes were AWESOME, the acting unbelievably good and the story well paced and meaningful. Michael B. Jordan is fantastic as Creed, but what makes this movie special for me is the humanization of the Drago boys. We actually sympathize with them and understand why they are what they are – which is really unique in any movie for the villain, let alone a Rocky flick. Training montages were on point too. A really good movie. 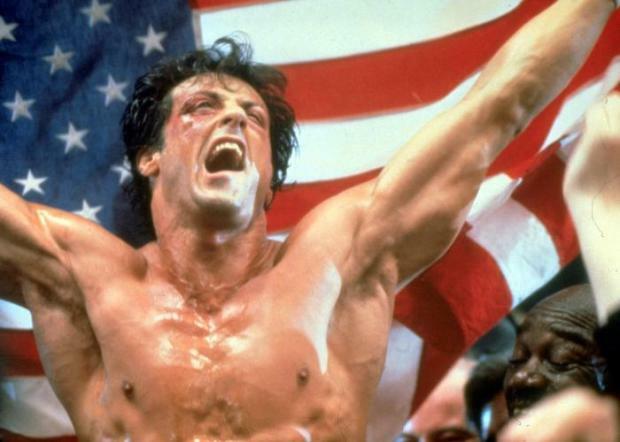 Rocky IV – This is probably the most “controversial” ranking to most who will read this, but I absolutely stand by it. This movie is AMAZING and touches all the beats you want (and NEED) from a Rocky movie. Awesome villain (Ivan Drago), incredible fight scenes, Emotions (Apollo’s death), Goosebumps (“The Russian is CUT! ), EPIC training montages (Russian wilderness vs Technology of Drago) and and amazing soundtrack. This movie is probably the most quoted (seriously, it’s true) of all the Rocky movies and rightly so. “Whatever he hits, he destroys!”, “If he dies, he dies” and “You can’t win!” are some of the real gems in this movie. When I introduced my kids to the franchise, this is the movie I started them with – because it is without a doubt the most entertaining of them all. Once they saw this one they were hooked. So many great scenes, but this one is my favorite – when Drago realizes in the final fight that the dude he is fighting is made of …..something else….. Damn – just going back through these it brought back all sorts of emotions I have for each movie. I absolutely love this franchise. Let me have it in the comments – do you agree? If not – why?